The Amazon listing, for the paperback, is here. It will be available also in hardback and bonded leather. Why not genuine leather, like the NOAB 4th? This is due to be released in March. Maybe they rewrote the study notes?? Nope. Study notes go with the NABRE. The reading guides have usually been quite good. Looking forward to reviewing them. Trustworthy study notes. Really? The NAB notes are not always trustworthy and the individual book intros reek of the worst of historical critical method which BXVI shot down in "Jesus of Nazareth" vol. 1. I'll pass on this volume. I'm just wondering how in the world a paperback version of this THICK work will survive. Thoughts anyone on the prospect of this study bible coming in paperback form? Does anyone else find it interesting that there is ZERO overlap with the scholars who wrote the reading guides and those writing the CCSS series? It seems like the polarization in the Church extends to every facet. Luke, I would say that both Fr Senior and the late Fr Daniel Harrington wrote endorsements for the CCSS. If the Bible has a Imprimatur it is trustworthy. "Thirteen scholars, including general editor Donald Senior, contributed to the 577 pages of “Reading Guides” that precede the text. 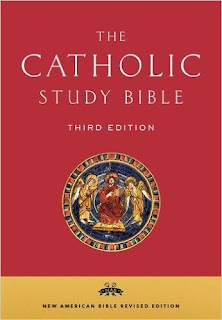 These contain brief academic introductions and section-by-section surveys of each book of the Bible, with bibliographies for further reading." I last saw this Bible around 1995 and I don't remember much about it. Sales will determine whether Oxford re-releases this in some variety of leather. I hate to say it, but to a certain extent the old saw has teeth: it seems Catholics tend to buy fewer Bibles per individual than Protestants, and tend to be satisfied with lesser quality craftsmanship in the Bibles they do buy. In a way, I see the possibility that R. L. Allan might bind a Catholic NRSV in their signature goatskin style as the one test that must be passed - If they make it, the Catholics better come, or no publisher will again consider publishing premium quality Catholic Bibles. Mark DeForrest: I like the NABRE 2010 edition but the Vatican website carries the 1970 OT. it has NO LINK listed for the Psalms ! after it and itself is NOT clickable. Jeff S.: you can access the Psalms (1991)on the Vatican website if you go the last chapter of Job and click on "Next" or go to the introduction for Proverbs and click on "Previous". 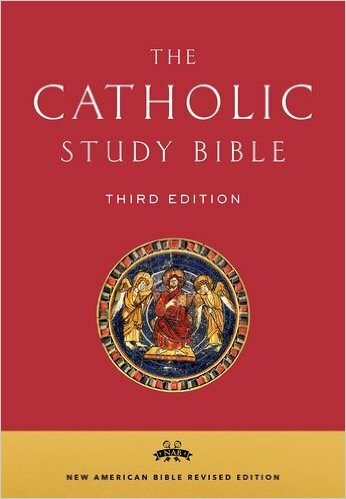 Why doesn't the Vatican website show the New American Bible Revised Edition of 2010?! Thanks for the tip. However, it's still very awkward. you have to do quite a lot of clicking. Jeff S.: Google psalm 122 vatican.va and click on it in results. Not always very consistent nor convenient. Do you know that the NABRE is on the USCCB website and BibleGateway? Have fun! and it's found in the NOAB RSV and NOAB NRSV (each with the Apocrypha)! Hopefully I don't have any typos here. as you should see below. Hopefully I don't have any typos here. I've been in touch with the publisher to ask they pursue rights to distribute RSV-2CE as well, and they are following up on it. the .HTM part of each link.